I have time with this . i think this pic made form official ! really really good work ! i add to my favorite XD! i will waiting for wallpaper form you ? Your vector was a good try and wow that is a lot of layers O.O. But if I could give you some friendly advise I would say to redo the lines and some parts of your vector because some parts and smooth and lot of others are jagged, a little messy and some parts are even blurred. I also think you forgot to vector some of the stuff toys on the bottom I noticed that and your lines are not as neat as they should be. How nice XD thanks for sharing! Wow, kudos for making this. Dunno if it's official but it's damn good art. lol..tobi is in there(one of the dolls)..haha..thanks.really nice wallpaper..
Oh .. their just my favorite! 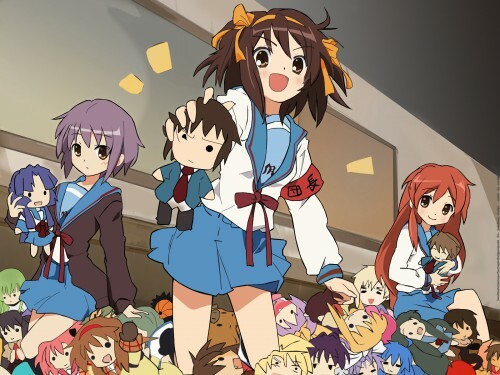 kyon doll is as exasperated as the genuine article, he'd rather be hugged by mikuru. lol. this artwork is very nice... saved!